Since its inception, the Society has sponsored historic plaques for Venice-area buildings. 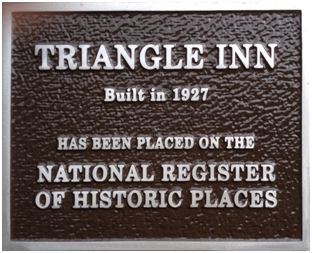 Currently, the Society is identifying appropriate commercial buildings for historic plaque designation. The buildings are located in an area of Venice entitled The John Nolen Plan of Venice Historic District, an area that was listed in the National Register of Historic Places in 2010. For more information, please refer to the Research Page of this website. The Historic Plaque Program is funded through the generosity of the Ehrhart Family Foundation. 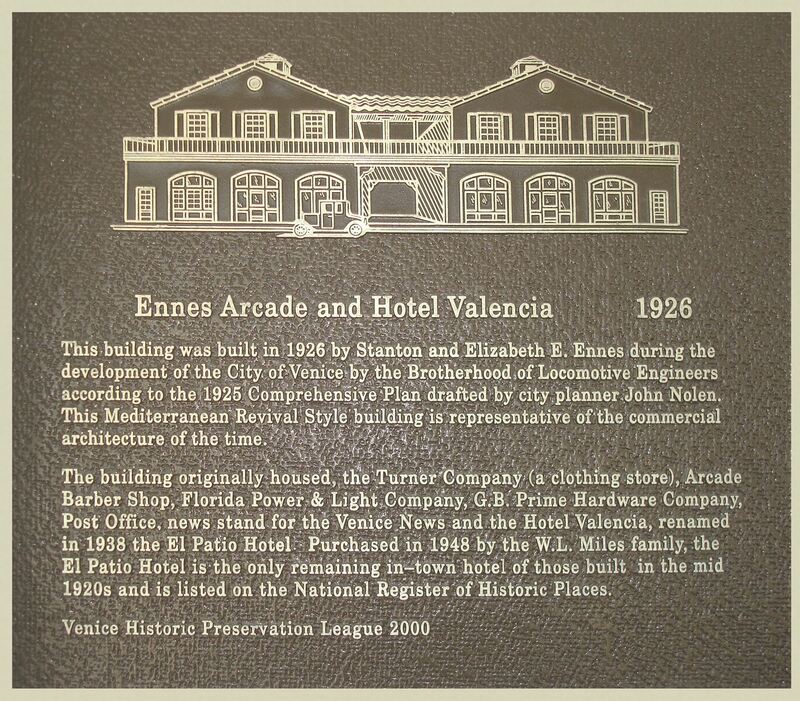 This plaque was prepared in 1996 by the Venice Historic Preservation League, Inc., later doing business as the Venice Area Historical Society (VAHS). It was the first plaque of any size created for installation on or adjacent to an historic building in the City of Venice by the Society. In June 1996, the plaque was presented to Dorothy Korwek, a former city councilwoman and, later, the city's Director of Historical Resources, by Jack Howell, President of the League. Ms. Korwek's efforts in coordinating the restoration of this historic structure resulted in its listing on the National Register of Historic Places in February 1996. The plaque is currently mounted on the external west wall to the left of the original front door, facing Nassau Street. Ennes Arcade and Hotel Valencia -- 1926. This building was built in 1926 by Stanton and Elizabeth E. Ennes during the development of the City of Venice by the Brotherhood of Locomotive Engineers according to the 1925 Comprehensive Plan drafted by city planner John Nolen. This Mediterranean Revival Style Building is representative of the commercial architecture of the time. The building originally housed, the Turner Company (a clothing store), Arcade Barber Shop, Florida Power & Light Company, G.B. Prime Hardware Company, Post Office, news stand for the Venice News and the Hotel Valencia, renamed in 1938 the El Patio Hotel. Purchased in 1948 by the W.L. Miles family, the El Patio Hotel is the only remaining in-town hotel of those built in the mid-1920s and is listed on the National Register of Historic Places. This plaque was installed in 2002 by the Venice Area Historical Society (VAHS). It was the second descriptive, full-size plaque mounted on an historic building in the City of Venice. Cast in bronze-coated aluminum for durability and appearance, the plaque is mounted on the outside of the south wall (facing Tampa Avenue) that surrounds the former hotel, now known as the Summit at Venice Assisted Living & Memory Care. 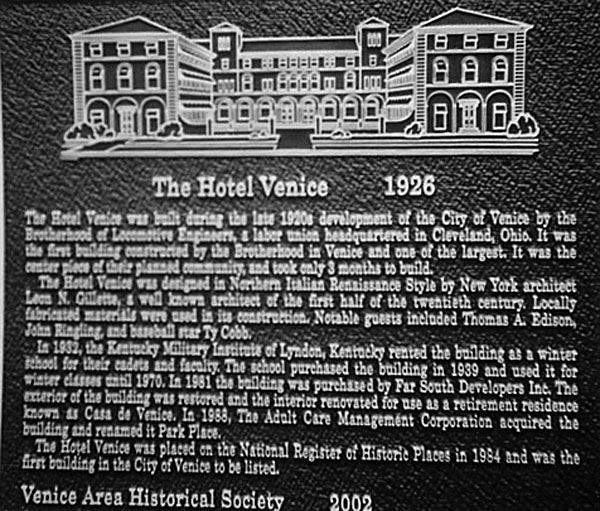 The Hotel Venice was built during the late 1920s development of the City of Venice by the Brotherhood of Locomotive Engineers, a labor union headquartered in Cleveland, Ohio. It was the first building constructed by the Brotherhood in Venice and one of the largest. It was the center piece of their planned community, and took only 3 months to build. The Hotel Venice was designed in Northern Italian Renaissance Style by New York architect Leon N. Gillette, a well known architect of the first half of the twentieth century. Locally fabricated materials were used in its construction. Notable guests included Thomas A. Edison, John Ringling, and baseball star Ty Cobb. In 1932, the Kentucky Military Institute of Lyndon, Kentucky rented the building as a winter school for their cadets and faculty. The school purchased the building in 1939 and used it for winter classes until 1970. In 1981 the building was purchased by Far South Developers Inc. The exterior of the building was restored and the interior renovated for use as a retirement residence known as Casa de Venice. In 1988, The Adult Care Management Corporation acquired the building and renamed it Park Place. The Hotel Venice was placed on the National Register of Historic Places in 1984 and was the first building to be so listed. This plaque was installed in 2003 by the Venice Area Historical Society (VAHS). It was the third descriptive, full-size plaque mounted on an historic building in the City of Venice. Cast in bronze-coated aluminum for durability and appearance, the plaque is mounted on the external east side wall next to the door facing Nokomis Avenue. 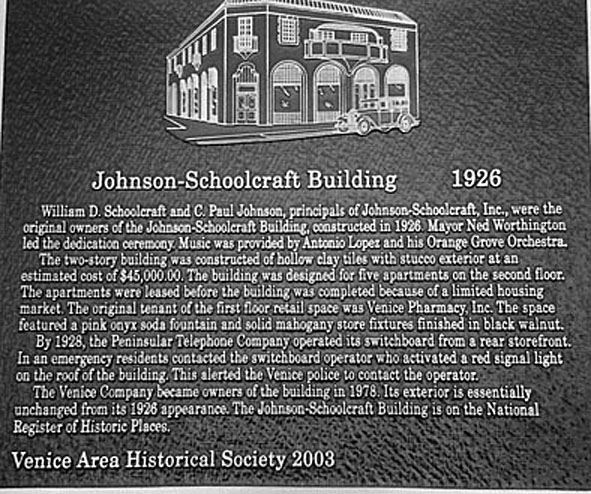 The building is now the home of the Venice Wine & Coffee Co.
William D. Schoolcraft and C. Paul Johnson, principals of Johnson-Schoolcraft, Inc., were the original owners of the Johnson-Schoolcraft Building constructed in 1926. Mayor Ned Worthington led the dedication ceremony. Music was provided by Antonio Lopez and his Orange Grove Orchestra. The two-story building was constructed of hollow clay tiles with stucco exterior at an estimated cost of $45,000.00. The building was designed for five apartments on the second floor. The apartments were leased before the building was completed because of a limited housing market. The original tenant of the first floor retail space was Venice Pharmacy, Inc. The space featured a pink onyx soda fountain and solid mahogany store fixtures finished in black walnut. By 1928, the Peninsular Telephone Company operated its switchboard from a rear storefront. In an emergency, residents contacted the switchboard operator who activated a red signal light on the roof of the building. This alerted the Venice police to contact the operator. The Venice Company became the owners of the building in 1978. Its exterior is essentially unchanged from its 1926 appearance. The Johnson-Schoolcraft Building is on the National Register of Historic Places. 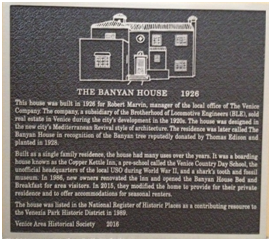 This plaque was installed in 2012 by the Venice Area Historical Society (VAHS). It was the fourth descriptive, full-size plaque mounted on an historic building in the City of Venice. Cast in bronze-coated aluminum for durability and appearance, the plaque is mounted on the external south side wall of the building next to the center door facing Tampa Avenue. The building, now called the Venice Centre Mall, houses several retail operations on the first floor and condominiums on the two upper floors. The San Marco Hotel was built in 1926 by the Brotherhood of Locomotive Engineers (BLE) as part of the initial development of the City of Venice. The hotel opened in November of that year after only 90 days of construction. The hotel had a decorative ground floor lobby and space for 13 shops plus a restaurant. The upper floors had 92 residential rooms with private baths. The hotel design incorporated the Mediterranean Revival style in keeping with the master plan formulated by John Nolen for the City of Venice. Its steel and concrete construction made it the most durable building in the city. The hotel was a showpiece of the newly emerging “City on the Gulf”, and then fell into disuse following the financial failure of the BLE in 1928 and subsequent effects of the Great Depression. The hotel sat empty until 1932, when it reopened as part of the winter campus for the Kentucky Military Institute (KMI), the oldest private prep school in the country. From January through Easter, cadets were quartered in rooms on the two upper floors and attended classes in the space available on the ground floor. This seasonal operation continued up to 1970 when KMI closed the Venice campus due to dwindling funds and the political winds of the time. The building was not used for a few years until renovations were made in the mid-1970s, again turning the former hotel into a mixed-use facility, with condominiums on the upper floors and retail units on the ground floor. The San Marco Hotel was listed in the National Register of Historic Places in 2010 as part of the John Nolen Plan of Venice Historic District. This plaque was installed in early 2016 by the Venice Area Historical Society (VAHS). It was the fifth descriptive, full-size plaque mounted on an historic building in the City of Venice, cast in bronze-coated aluminum for durability and appearance. The plaque is mounted on the external west wall of the building next to the front door, facing Harbor Drive. The building was originally constructed in 1926 as a single family home and has served a number of purposes in the intervening years. For almost thirty years, it was a noted bed-and- breakfast. It is now, once again, the personal residence of the owners with certain provisions for seasonal renters. This house was built in 1926 for Robert Marvin, manager of the local office of The Venice Company. The company, a subsidiary of the Brotherhood of Locomotive Engineers (BLE), sold real estate in Venice during the city's development in the 1920s. The house was designed in the new city's Mediterranean Revival style of architecture. The residence was later called The Banyan House in recognition of the Banyan tree reputedly donated by Thomas Edison and planted in 1928. Built as a single family residence, the house had many uses over the years. It was a boarding house known as the Copper Kettle Inn, a pre-school called the Venice Country Day School, the unofficial headquarters of the local USO during World War II, and a shark’s tooth and fossil museum. In 1986, new owners renovated the inn and opened the Banyan House Bed and Breakfast for area visitors. In 2015, they modified the home to provide for their private residence and to offer accommodations for seasonal renters. The house was listed in the National Register of Historic Places as a contributing resource to the Venezia Park Historic District in 1989.